So far this week, I’ve featured spaces that fit my definition of “boho chic”. For today’s “Fabulous Room”, we are heading in a different direction. This brilliant—and enormous living room designed by Peter Mikic who also happens to own the home, is full of the signature glamour that I love. 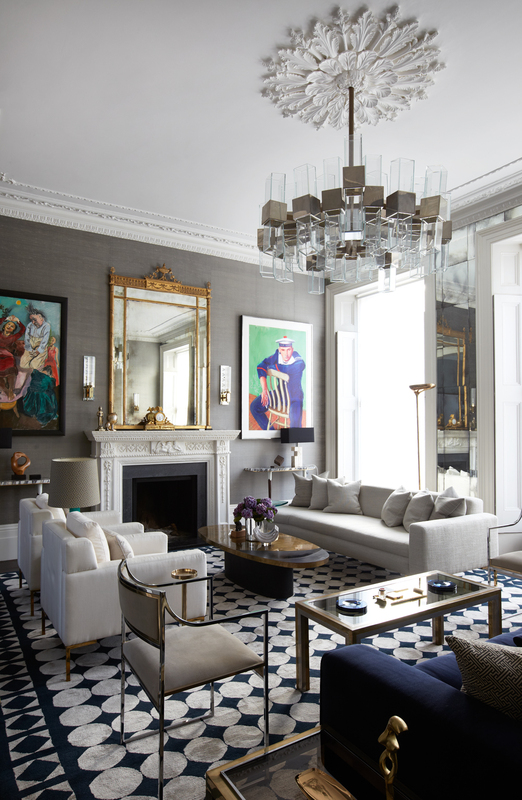 What was once a dilapidated townhouse in Notting Hill has become modern, exuberant, and undeniably glamorous. “I wanted the house to look as though Claridge’s hotel had been transported to 1950s Milan,” Mikic explained to ELLE DECOR. 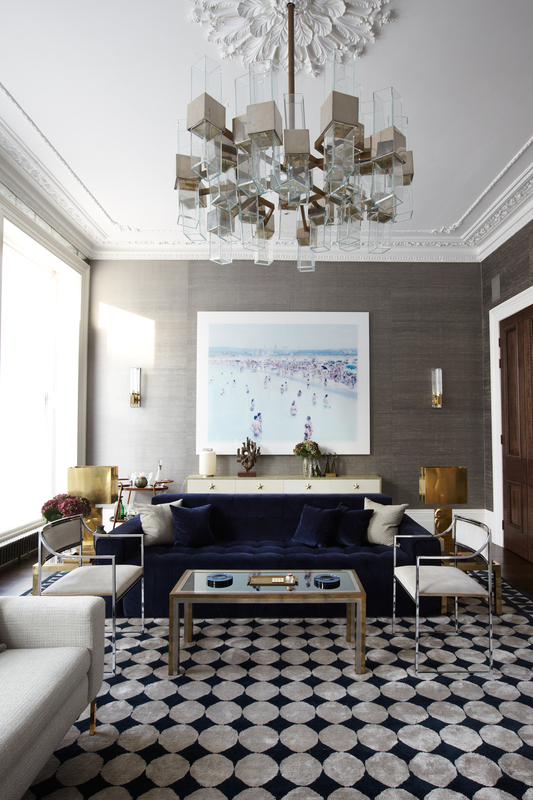 The living room is particularly beautiful for its use of saturated blue and grey hues, beautiful blend of textures, as well as for the unique accessories and furniture throughout. I love that Mikic wasn’t afraid to mix metals—note the fabulous brass lamps and the nickel chairs in front of the sofa above. As you’ve probably already noticed, the space is dotted with bold pieces of art as well as interesting shapes from the stunning chandelier to the cocktail tables. Notice the wall of windows is lined with antiqued mirrors as opposed to the grasscloth that covers the other walls. It’s special touches like this that can completely elevate a room—and it certainly doesn’t hurt to start off with great bones! Do you like the glamour and grandeur of this room or do you prefer your interiors to be a bit more cozy? This space is awesome! Definitely pinning it! I absolutely love everything about this room! I want to transport every piece into our new living room (a girl can dream)! I do like rooms that you can relax in, but Ooooo la la is this room GORGEOUS! I love everything about it. Every glance I spot something else that is chic about it. Definitely pinning this baby! wow, I love his work. Fabulous. Wow! Thank chandelier makes me melt. I can say enough nice things about this room - from the floors, blue velvet couch, chandelier and ceiling detail, the fun and bright paintings offsetting the elegance of the room and the mix of sofas and chairs (I'm out of breath).. When can I move in?